I've been in grad school at the U of MN for the past two years. I'm super close to being finished. 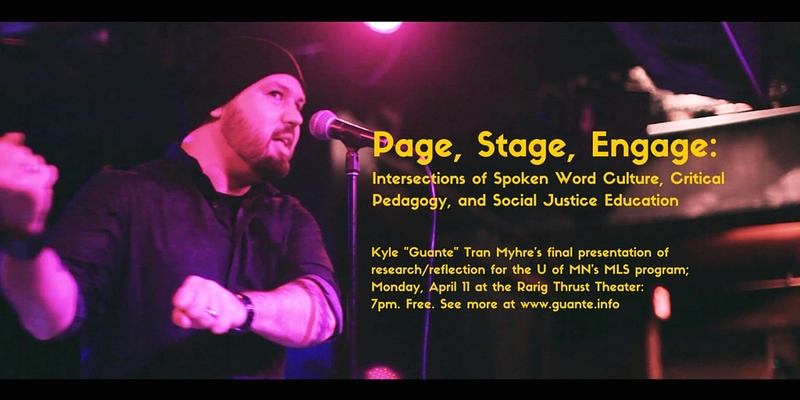 If you're interested in my research, you can come check out this public presentation/performance on Monday, April 11 at the U of MN's Rarig Thrust Theater. 7pm. Free. I won't go into super-specific detail here, but my project basically centers around how spoken word can be a useful tool for making social justice education programs not just more engaging or more entertaining, but more critical. We are often tasked with covering specific topics: consent, microaggressions, bystander intervention, identity & privilege, etc. But part of my project is about figuring out how we can talk about these things while also cultivating real dialogue, making systems of power more visible, challenging capitalism and the neoliberalization of the university, encouraging agency and activism, and creating spaces for real collaborative learning and organizing. Especially when we're talking about first-year orientation and welcome week programs, where time is short and real relationship-building is a challenge, I'm interested in how spoken word (whether through live performance, online video, or generative writing prompts-- and the open discussion that would accompany all three) can be used by facilitators to do the kind of work that powerpoint presentations or bullet-point lists of statistics can't do. There will be a free, public, online element of my project too, so if you're interested in that kind of thing but can't make it to the event itself, stay tuned. Wow! 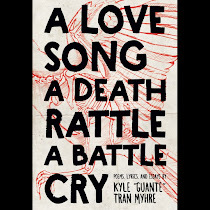 Thank you Kyle for sharing your work and this invite. Congratulations on being so close to finishing your grad school work. I can't wait to see what you do next.